Galganov's Recipe for Eggs Galganoff!! 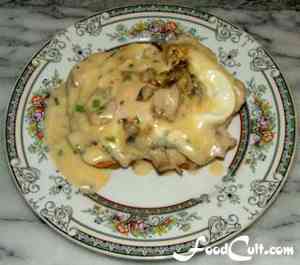 Eggs Galganoff is an egg fried on mushroom with a little onion, covered in cheese sauce - served on a slice of lightly toasted bread. For this recipe you will need to make (or have, left over,) some cheese sauce. Cheese sauce for this dish is best prepared using about 40 to 45% cheddar and 55 to 60% medium gouda plus a generous addition of parmesan. Cut in garlic chives, at the beginning, to give your sauce an added dimension. Once the sauce is prepared stir in fresh ground mixed pepper corns. Naturally, you may/should use your favourite cheese sauce but we've found this sauce works nicely with this dish. Heat a little salted butter in the pan. When the butter is melted, distribute the onion over the bottom and add the mushroom. Crack the egg and put it into the center of the pan. Let the egg cook just a little bit then cover it with cheese sauce and cover the pan. Let cook on medium-low heat. Put the slice of bread on to toast lightly. By the time the bread is toasted the egg should be done - but watch to see that the egg doesn't over-cook while toasting the bread. With the spatula, slide the egg, with all its layers, onto the toast and serve with an extra slice of bread to sop up the left-over goodies. Making cheese sauce? Make sure you have left-over sauce for Eggs Galganoff. Cheese sauce, properly stored, will keep, safely, for a few days in the fridge. Eggs Galganoff is one of our own, original creations. As with most great ideas its creation was incidental. It was born from the need to use up left over ingredients. It is fast becoming a favourite ... a casual, satisfying egg dish touched with elegance - rich in flavours.